Each of the students listed above competed October 6, 2015 at our school competition, where judges chose our Anthology and Original winners. 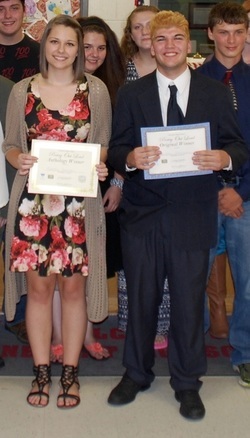 Congratulations to Natalie Harrison, our Anthology winner and Auston Thomason, our Original winner! These students will attend the Finding Your Voice workshop for school winners October 30, and will represent Vinemont High School at the Region 5 Competition at UAH November 13, 2015. Our 2015 Poetry Out Loud winners with their certificates. Each will go on to represent our school at the regional competition in November. Winners of the regional competition will compete at the state competition in Montgomery in February. State Anthology winners receive $200 and an all-expenses paid trip with an adult chaperone to Washington, D.C. this summer, where he/she will compete at the White House! The first runner-up receives $100. A total of $50,000 in awards and scholarships is awarded annually at the National Finals in Washington, D.C.
​visit Poetry Out Loud's website! Congratulations to Natalie Harrison, Auston Thomason, and CJ O'Neil for their amazing performances at the Region 5 Poetry Out Loud Competition at UAH. We are so proud of you! 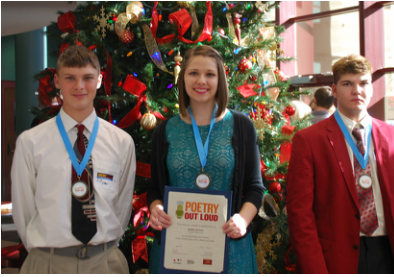 Auston and CJ competed in the original competition, and Natalie competed in the anthology competition. The top five from each competition will continue on to State in February. Natalie placed third in the Region 5 competition, so she will represent Vinemont at the State Competition!